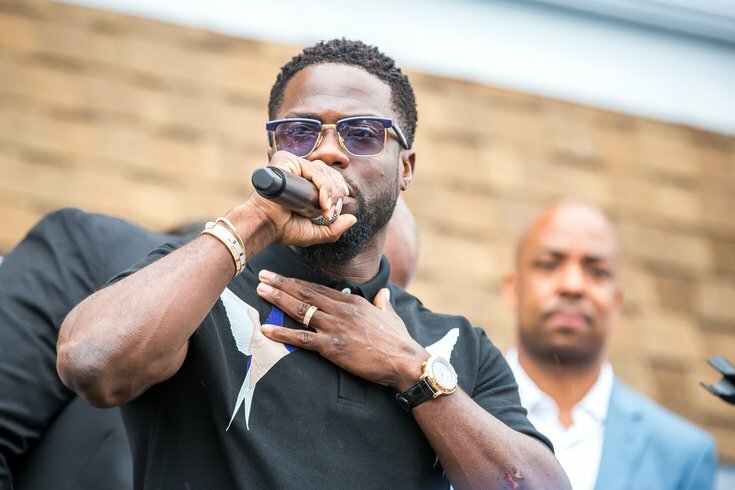 Actor and comedian Kevin Hart speaks to the crowd gathered outside Max's Cheesesteaks at Germantown and Erie avenues on Thursday, July 6. His appearance in the neighborhood where he grew up was part of the city's 'Kevin Hart Day' celebration, during which a portrait of Hart was unveiled by Mural Arts Philadelphia. Kevin Hart, the noted comedian and film star with North Philadelphia roots, was an unpopular man when he stepped onto a live radio set to talk Super Bowl LII in Minneapolis on Friday. Apparently, Minnesota Vikings fans still bear some ill will toward Philadelphia Eagles fans after the Eagles trounced the Vikings in the NFC title game in South Philly two weeks ago and earned the right to battle the New England Patriots for a Super Bowl title on Sunday. And then there were the viral videos showing Eagles fans acting a tad too hostile toward Vikings fans at Lincoln Financial Field that day, which haven't helped matters. Naturally, Hart was booed mercilessly he walked onto the set for a guest appearance, sporting a kelly green Eagles hoodie. The onlookers didn't like when he displayed the kelly green lining inside his black jacket, either. But they approved when Hart took it upon himself, "because I'm obviously a good dude," to act as a de facto spokesperson for the City of Philadelphia and apologize to Minnesota for how some Vikings fans were treated on their visit to Philly. "I know why you guys are upset. I'll apologize on behalf of my city. I don't like the way that we treated you guys when you came to the game," Hart said, turning the jeers into rousing applause just like that. "As a spokesperson for Philadelphia, Pa., I've taken initiative and I've stood up and I've said, 'You guys, that's not acceptable. We can do better. We will do better. Understand? My city, we're not used to winning. We're not used to winning. This is new territory for us." But, there was a catch. Because of there was. "With that being said, you've still got to deal with the fact that we're in this game," the comedian said with a wide smile, sparking boos once again. "You've still got to deal with the fact that my Eagles are about to fly." Hart went on to tout Philly and the "greatness" that the city has produced, and talked some sports smack because he could. "Right now, this is the first time in my city has been in a position where we can actually talk trash about sports, from the Sixers and the Eagles. Now baseball has been different, and hockey has been different ... for the first time in years, the Eagles and Sixers are in the conversation at the same time."